Our good friends Katie and Michael recommended Seven Hills (named after the 7 hills of San Francisco: Telegraph Hill, Nob Hill, Russian Hill, Rincon Hill, Mount Sutro, Twin Peaks and Mount Davidson). We had an early reservation and after several minutes, the Chef came out to say hello to our table. As we were introduced by Katie and Michael, I had no doubt we were about to have a really special dinner. It was such a pleasure to meet Alex Alioto and Alex Solomou, the partners of this fantastic restaurant, located on Nob Hill at 1550 Hyde St. Alex Alioto, the Chef, shared with us that he worked in restaurants in Italy and Germany, as well as The Ritz Carlton in San Francisco, working with Ron Siegal (who used to be the chef at Masa’s) and The French Laundry. We shared Appetizers consisting of Salt Seared Monterey Bay Calamari with a delicious Eggplant Caponata, Roasted Niman Ranch Bone Marrow with a Parsley and thinly shaved Black Radish Salad (along side some Crostini and Hawaiian Red Sea Salt to garnish), and Grilled Mackerel with an Olive Tapenade. All outstanding! The fresh pastas were light and delicious. I don’t order pasta often these days, but I had feeling their Carbonara would be worth the calories. It was amazing and I especially loved the generous, savory pieces of Fra’ Mani Pancetta. 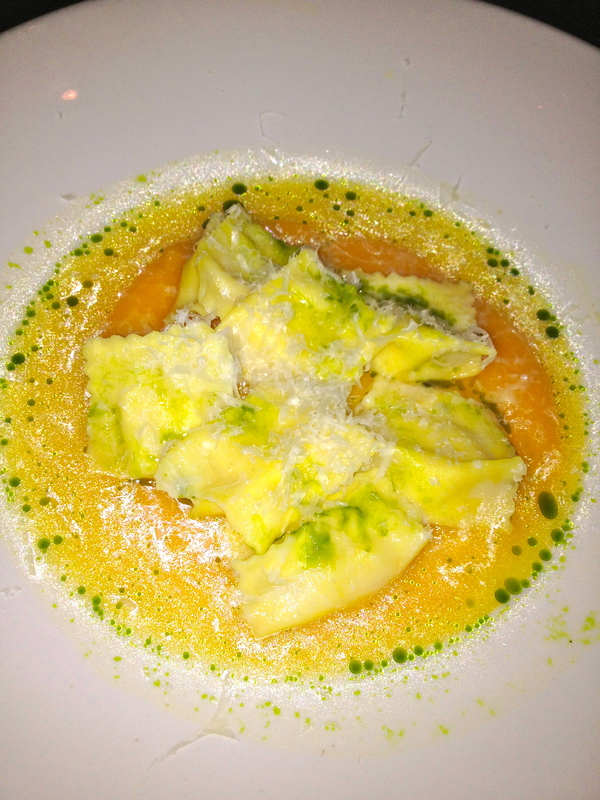 One of the other stand out pastas of the night was a Tallegio Cheese Agnolotti with Squash Puree and Vegetable Broth. The Squash Puree was delicate and the infused green oil floating on top of the broth was a lovely sight. Thanks for sharing a bite, Jenny, and Victor for ordering some great wine! For dessert, we shared some House Made Fresh Ricotta Cheese “Doughnuts” with an Orange Creme Anglaise. The Ricotta was mixed into the dough and they were lightly dusted with sugar. If you’ve ever had Ricotta Pancakes, they were similar, but even better since they were crispy all around. I especially loved the orange zest. Can’t wait to go back! Hmmm…I think I need to make some Lemon Ricotta Pancakes soon!